Parvo is a devastating disease that is often times fatal. The parvovirus acts quickly. Healthy dogs can succumb within a few days if medical attention is not provided soon enough. Thankfully, though, this horrible disease can not only be addressed by a veterinarian, it can also be avoided. Fast action is needed whenever dogs – especially puppies – start showing symptoms. It could mean the difference between life and death. Another form of parvo, one that is less common, attacks the heart. It affects the heart muscles of young puppies, and it is often fatal. But humans can unknowingly spread the disease as well. For example, if they step in infected feces and bring it into the home on their shoes, a dog can become infected. The parvovirus is very resilient. It can live in soil for as long as a year or more. Certain breeds of dogs appear to be more prone to contracting parvo than others. 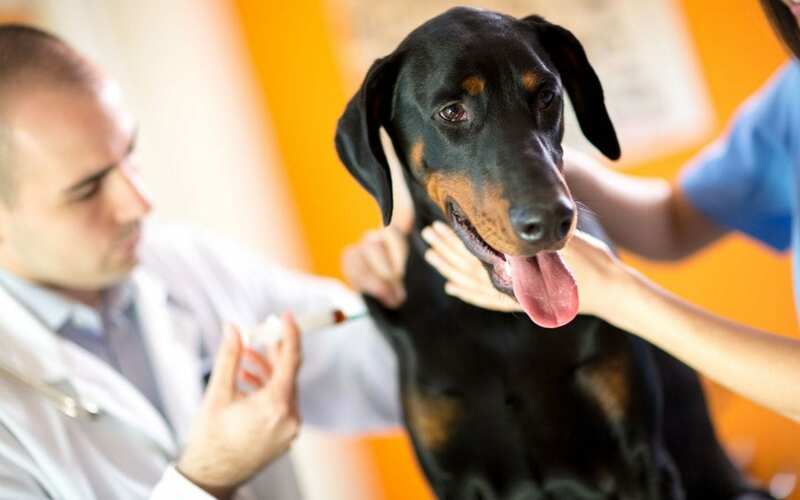 These include Dobermans, English Springer Spaniels, German Shepherds and Rottweilers.8 Scientists haven’t yet found the answer as to why this is the case. It’s important to know the symptoms of parvo if you have a dog. Here are some of the more common ones. If you notice any of these symptoms, get in touch with your vet immediately. Even if parvo isn’t the cause, there could be some other serious condition that is threatening your dog’s health. Dogs showing signs of parvo need to receive immediate medical attention. Again, quick action could make the difference between life and death. More than likely, your vet will recommend hospitalization for your pet. Isolation will be needed in order to keep the virus from spreading to any other dogs in the facility. The methods of addressing the issue will depend on its severity. If your puppy is not yet vaccinated, or their vaccination program is not complete, you’ll need to take as many precautions as possible. Parvo is a vicious, devastating disease. It is easily transmitted from dog to dog, and, tragically, it is often fatal. But if you are alert to the signs of parvo, and you act quickly enough, your dog may survive and eventually get back to full health. Take the steps you need to keep your pet protected from parvo, but be ready to act quickly if it should strike. Should I Get Insurance For My Dog? Is It Worth the Cost?